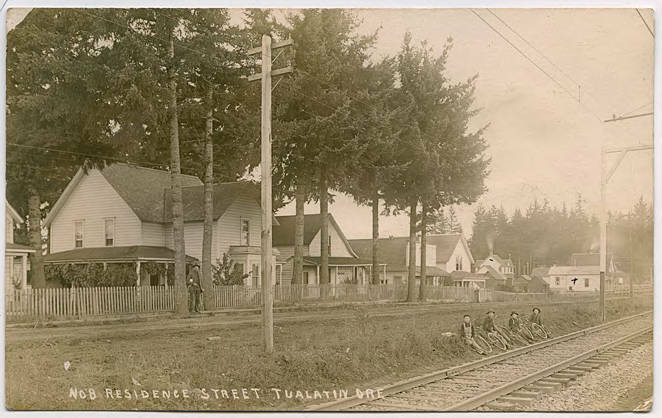 Photographic postcard of a residential street in Tualatin, Oregon. The letter on the back describes some of the landmarks in the photograph. [front] No 8 Residence Street Tualatin Ore [back] The house with the mark on it is I. N. Robinson's new house (rear view too) they have their home fixed up very nice I don't remember how many houses there was along this road when you was here The bl'dg with the cross on it is the Tualatin bakery. 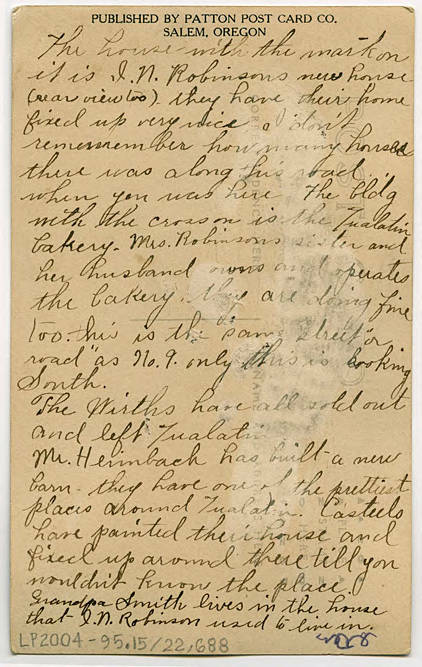 Mrs. Robinson's sister and her husband owns and operates the bakery. They are doing fine too. this is the same street or road as No. 9 only this is looking South. ; The Wirths have all sold out and left Tualatin. ; Mr. Heimbach has built a new barn - they have one of the prettiest places around Tualatin. Casteels have painted their house and fixed up around there till you wouldn't have known the place. Grandpa Smith lives in the house that I. N. Robinson used to live in.